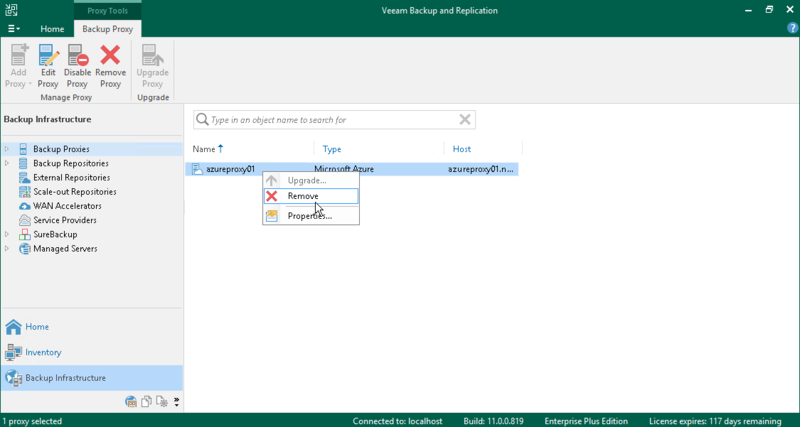 Veeam Backup & Replication does not provide a possibility to edit settings of deployed Azure proxies. If you want to change Azure proxy configuration, remove the Azure proxy and create a new proxy. In the inventory pane, select Backup Proxies. In the working area, right-click the Azure proxy and select Remove. If you want to remove an Azure or an Azure Stack account from Veeam Backup & Replication, you must remove all Azure proxies first.